The Zoo & Wildlife Biology program is designed to prepare students for careers working with animals and is offered in collaboration with the Cleveland Metroparks Zoo. Theoretical and applied coursework and integrated experiential opportunities are combined in this intensive degree program, which includes summer school courses and extensive opportunities for internship and research experiences. Our curriculum is organized so that most of our students also receive a minor in Psychology. In addition to the Cleveland Metroparks Zoo, Malone has professional partnerships with several local institutions including Stark Parks, Beech Creek Botanical Gardens, Clover Field Wildlife Care, and Quail Hollow State Park. Malone maintains an exotic animal collection consisting of a variety of invertebrates, freshwater and saltwater fish, birds, mammals, and native and exotic reptiles. Why study Zoo & Wildlife Biology at Malone? As a student enrolled in one of the few Christian (or private) universities to have a zoo and wildlife biology program, you'll have the opportunity to study under professors who are deeply committed to the integration of the Christian faith into the classroom. Small class sizes, as well as intentional and personalized advising, allow students the opportunity to make the most of their curriculum and required courses. You'll gain extensive experiences in animal husbandry, animal training, scientific research, and environmental monitoring. You'll have the opportunity to work with Malone's collection of small mammals, reptiles, birds, and more. Internships are a vital part of your education, and you are encouraged to pursue as many as you are willing! Students have interned at the Oregon Zoo, Cleveland Zoo, Akron Zoo, Columbus Zoo, with the Navy Marine Mammal Program, and many other areas. Each course and requirement for this major is listed in the official Academic Catalog. 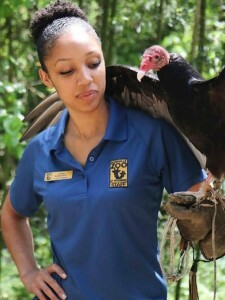 After completing her degree at Malone, recent alumna Corina Newsome started her new job as an Ambassador Animal Keeper at the Nashville Zoo.